The Council is finally to achieve its objective. In 1995 the Council declared the Dalston Theatre a site for redevelopment. 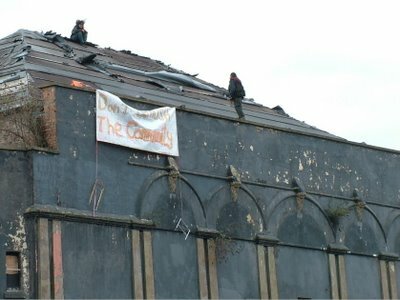 In 1997, despite a petition of 25,000 signatures and 12 deputations, the Council still decided to evict the Four Aces, Labrynth and community organisations from the buildings so that it could sell the site to a developer. The development didn't materialise. Then in 2003, after the buildings had remained boarded up and on death row for 5 years, the Secretary of State gave outline approval on appeal for their demolition and redevelopment. Since December 2005 OPEN has obtained court injunctions to stay the Council's hand and urged the authorities to consider reusing at least some of the buildings. 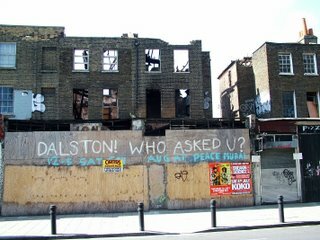 But the decision to fund New Dalston's Olympic bus station, by demolishing historic Dalston and selling the land for towerblock developments, had already been taken before the recent public consultation started. The Council, the Greater London Authority and the Secretary of State have refused to change the plans. 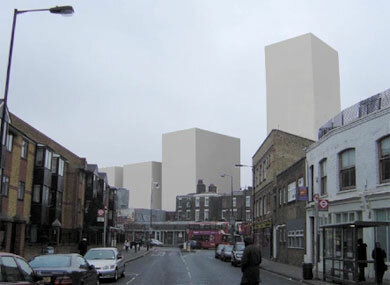 Next they will implement the demolition plans for Dalston Lane north. All these decisions have contributed to the planned destruction of old Dalston. Philistinism: the vandalism of our heritage and culture as justified by institutional policy. 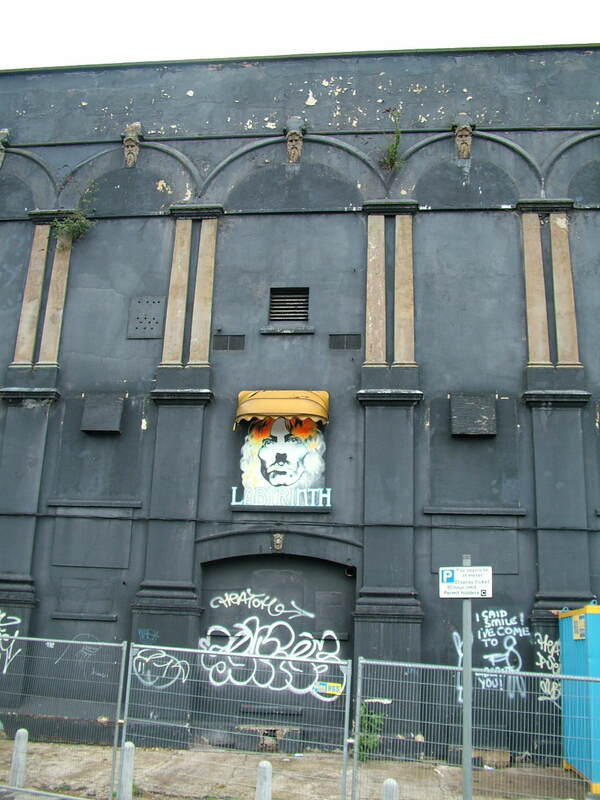 On 29 November Judge Gilbart QC refused OPEN permission to proceed with judicial review of the planning permissions granted by Hackney Council to demolish the Dalston Theatre, the locally listed Georgian houses and the oldest Circus entrance in the UK at 4-12 Dalston Lane E8. The planning permission entitles the London Development Agency (LDA) to replace the historic buildings with residential towerblocks of up to 20 storeys but which will have only 24% affordable housing. The Greater London Authority and the Secretary of State have refused to intervene. The Judge found, in effect, that the Council has a very wide discretion as to how it may deal with its property. The Council was, for example, entitled to depart from its policies which aim to protect and retain historic buildings, and was not under a duty to consider an alternative scheme for the site which would incorporate any of the historic buildings or to asses their viability for re-use, particularly when there was a redevelopment scheme proposed which the Council approved. The Judge’s view conflicts with the legal advice which OPEN had previously received. The Judge also refused OPEN’s application for there to be a cap on the legal costs which might be claimed by Hackney Council from OPEN should the case proceed and ultimately be lost. 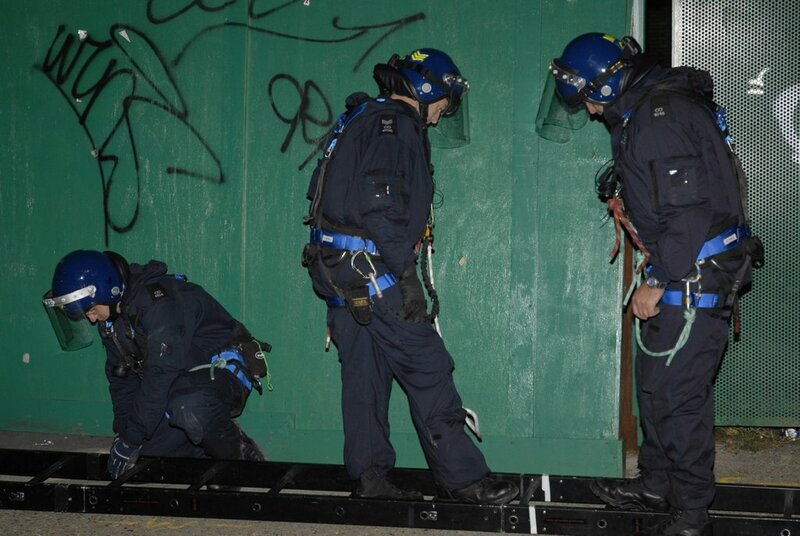 The Council has produced documented evidence that it had been charged over £90,000 by a security firm for the eviction of the theatre occupiers on 2 November and that it is paying for 24 hour guards on the site, at a cost of over £22,000 per week, to secure the site until the demolition. The Council required OPENs agreement to meet those expenses if the injunction protecting the buildings from demolition were to be extended. In view of the Judge's decision, and the prospect of facing an unlimited liability for costs and possibly a claim for the Council’s security expenses should the case continue and be lost at the end of the day, OPEN Directors felt unable to pursue the claim for an extension of the injunction. On this basis the injunction protecting the historic buildings has been discharged by agreement on 1 December. 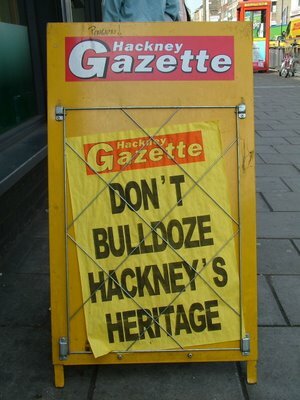 Hackney Council is now free to proceed with demolition. Lord Low of Dalston had arranged a meeting on 17 November between the London Development Agency’s Chief Executive Manny Lewis and OPEN’s representatives, to discuss the numerous concerns about the LDA’s plans for Dalston. On 29 November the LDA responded to the issues raised, saying that it could take around 15 months for a major redesign of the scheme and that there would be substantial expense to incorporate any of the historic buildings. 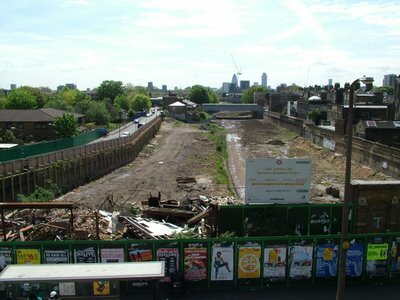 The TfL scheme is to be subsidised by the sale of its own and the Council’s demolished site to a developer, Barratt’s. 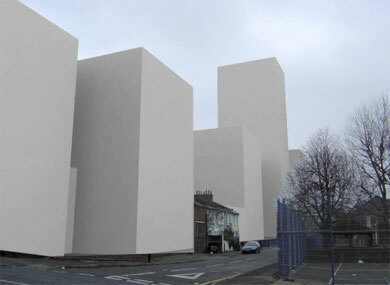 The LDA stated that Transport for London’s timescale, to conclude the contract to build a concrete slab over the railway cutting to support a bus station and private towerblock flats, meant that an immediate decision needed to be made whether to proceed with the two schemes which had been granted planning permission by Hackney Council. When reviewing the structural engineer’s reports obtained by the Council OPENs independent structural engineer Brian Morton MBE said “The condition of the historic buildings has been brought about by the deliberate neglect of the owners....We have repaired many buildings in similar condition, indeed some in much worse condition, and these works have not proved significantly expensive”. 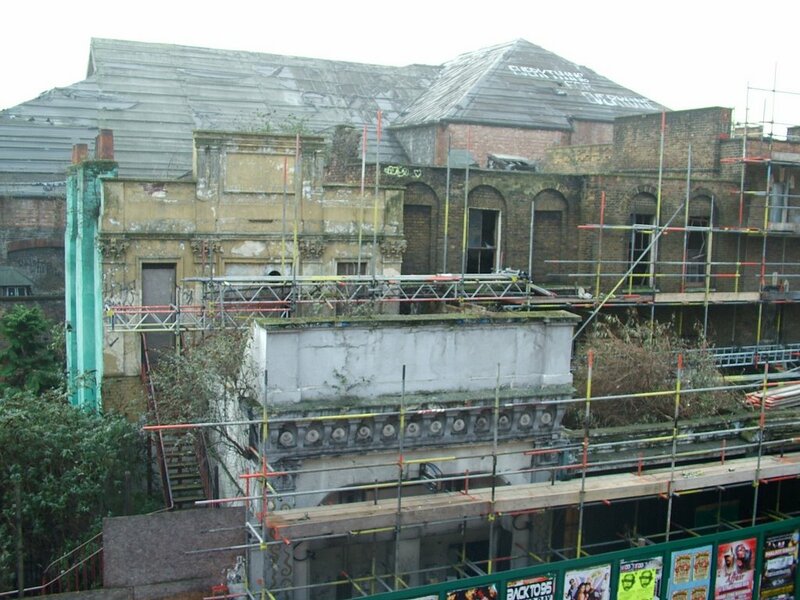 For 18 months OPEN has been urging the authorities to consider preserving something of Dalston’s unique historic character to assist the regeneration of the area. What has become clear is that they agreed to demolish everything long before the public consultation started so they could maximize the profit from the sale of the Council’s site to finance TfLs new bus station. The hundreds of legitimate objections from the local business and residential community, and from national societies and trusts, have fallen on deaf ears. Now they say that it is too late to change their plans. A history of this site can be seen below at "The story that was never told". Click on the images below to see them bigger and to print out. 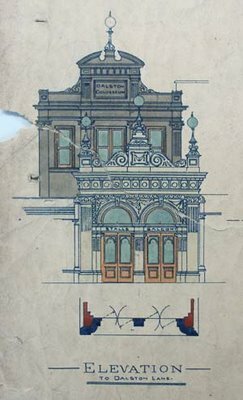 The High Court today granted OPEN another injunction forbidding Hackney Council from demolishing Dalston Theatre, the 1886 Circus entrance and the Georgian and Victorian houses at 4-12 Dalston Lane, London E8. The buildings had previously been protected by an injunction which was issued on 5 April 2006 but, following the Council granting planning permission to the London Development Agency (LDA) to demolish the buildings and replace them with tower blocks, that injunction lapsed on 18th September with Hackney Council promising not to commence any demolition work for a further 4 weeks. In Court today Hackney Council refused to give Mr Justice Sullivan an undertaking that it would not commence demolition work and so the Order was made to continue protection of the buildings until the application comes back to Court for a more detailed hearing on 1st December. On 9th November the Secretary of State’s representative issued a decision that the LDAs planning application will not be "called in" although the LDA's planned development provides for only 24% of the new flats to be “affordable housing”. OPEN obtained a structural report from Mr Brian Morton MBE, Engineer to Canterbury and Bury St Edmunds cathedrals, following his inspection of the buildings in August 2005. He found that repair of the Theatre for a variety of uses, and of the historic houses, was possible. Hackney Council has produced a new structural engineer's report which states that repair of the Dalston Theatre is now no longer “practical” and, in view of this finding, the Council now claim that planning permission for its demolition is technically no longer required and that it can demolish the Theatre using “permitted development” rights which merely requires its own Planning Department’s agreement. 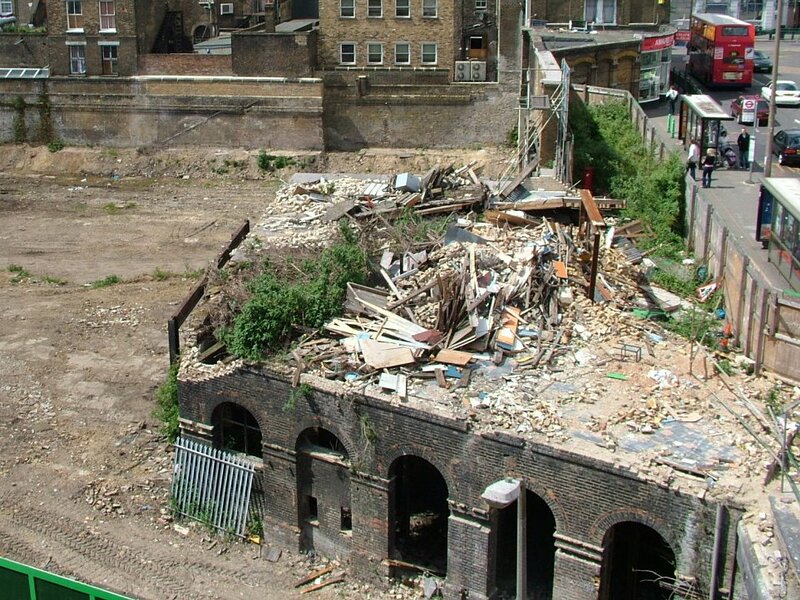 Hackney Council have produced no evidence that re-use of the 1886 Circus entrance and the Georgian & Victorian houses at 4-12 Dalston Lane is not possible, but still insist on demolishing them too. Further information on the history of OPENs struggle to get Hackney Council to consider the potential for re-use of these buildings can be found below – particularly “The story that was never told”. Fortunately no blood was spilt but the protestors were soon on the street and the Council are then reported to have broken all the ground floor windows before sealing up the building. Despite the Secretary of State's recent direction that the Council must not issue the planning permission to the London Development Agency to demolish the buildings, the Council has stated that it is now free to proceed with the demolitions. OPEN has warned the Council that, if it trys to predetermine the Secretary of State's investigation in this way, a further application to the High Court will be made for an injunction. OPEN issue fresh Court proceedings. Secretary of State's planning intervention. "The Council's Head of Planning met with members of Hackney Management Team/Cabinet yesterday. They remain committed to the expeditious demolition of the existing buildings on the site... The Council are unable to agree to any further delay in the demolition and will proceed in this regard as soon as is practical"
"Hackney Council have been directed by the Secretary of State not to grant planning permission to the LDA without specific authorisation from her whilst she considers an application that the matter be called in "
This is the story of how, within a space of 10 years, 185 years of our local cultural and architectural history in London's Dalston has come to face destruction. 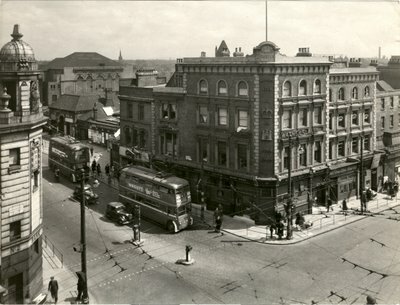 This scene is of Dalston Lane south in about 1940. The view today is now much as it was then, although in the intervening years the Holly Street Estate towerblocks could also have been seen until after just 20 years they were condemned as high rise slums and eventually demolished. You can see the Crown & Castle pub on the corner, Holy Trinity's church spire behind it, the Dalston Junction railway station entrance and next to it the old Dalston Theatre. This area is now facing demolition and redevelopment as a bus station and new towerblock flats. At 8-10 Dalston Lane stand two 1820 Georgian houses. They are among the earliest ever built in the Lane and are listed by the Hackney Council as having special character and interest. The Council's policy is to retain and enhance such buildings, but it hasn't done so in this case. The remaining houses in the terrace were cleared from the path of the railway when it first arrived in Dalston in the mid 1860's. After the railway's arrival, an open air circus used the cleared ground around the Georgian houses until one Alfred Brandreth saw the site as an opportunity to create a grand building for popular entertainment and the performance arts. A newspaper published this artist's sketch of the North London Colosseum and Amphitheatre when it opened for its first season on 1st November 1886. Robert Fossett's Circus performed here with clowns, acrobats and jugglers as did Professor Collier's giant and midget elephants. Horse riders performed feats of daring. 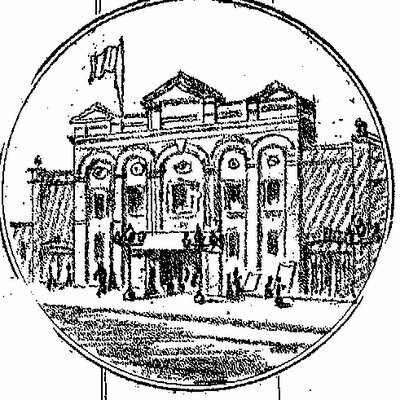 The new circus building could accommodate 4,000 spectators. It had winter gardens, smoking rooms and extensive stables and the painted ceilings were described as "bright, cheerful and picturesque". 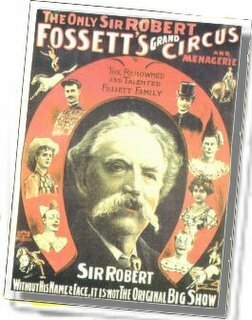 The Roseberry Place entrances were decorated with carved heads of horses and elephants and "being most conveniently situated next to Dalston Junction railway station... it turned away several hundreds last Saturday night"
The performers and the elephants could enter the circus ring by a separate entrance, built next to the two Georgian houses, at 12 Dalston Lane. English Heritage has described this entrance, with its stepped parapet and Corinthian pilasters, as "altogether quite delightful". The Theatres Trust has found it to be "very rare because it pre-dates all of the surviving British examples". It is unique - the oldest circus entrance in the country. An urban gem. Public tastes changed and in 1898 the building was converted to a Victorian variety theatre. This architect's drawing shows the old circus entrance behind and the design for the new theatre entrance which was built in front of the original at 12 Dalston Lane. 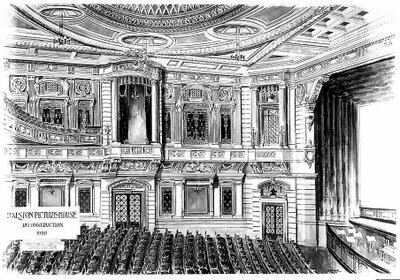 Many famous West End actors and music hall artistes performed here. It is said that Hackney's very own Marie Lloyd, who lived locally in Graham Road and became the international Queen of the Music Hall, worked both the Dalston Theatre and the Hackney Empire in the same night. A carriage waits outside the entrance of the Dalston Theatre in 1920, just after the Great War when, Compton Mackenzie recalled in his memoirs, his father managed Dalston Theatre. 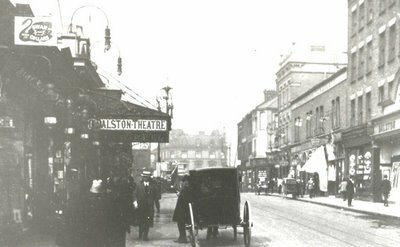 The invention of cinematography and the moving image saw Dalston Theatre's conversion in 1920 at huge expense. When Lord Beaverbrook opened it, with Hackney Council's then Mayor Herbert Morrison, he declared it to be "the greatest cinema in the British Empire if not the world". 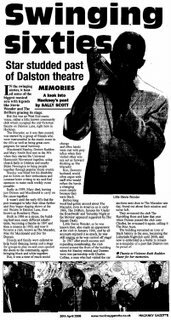 Many Dalston residents recall going to the pictures there. Fortunes were spent on the conversion. Described at the time as "huge in size, unrivalled in brilliancy set in its opulent draping of black and gold" the magnificent new interior became the jewel in Dalston's crown. 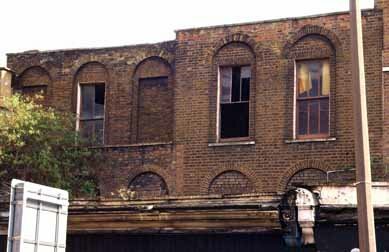 But the advent of television in the 1960s saw the closure of many of Dalston's 12 cinemas. It was time for the building to reinvent itself again. In the early sixties Doreen Raddon, Charles Collins and Newton Dunbar founded the music clubs at 12 Dalston Lane which were, for the next 33 years, to become the home of black music in North London and a second home to black musicians. Stevie Wonder, Desmond Decker, Jimmy Cliff, Bob Marley, Billy Ocean, Ben E King and many other international stars either performed or were guests here. Trees were planted in the garden in memory of the young people who perished in the New Cross fire and one in memory of Bob Marley. 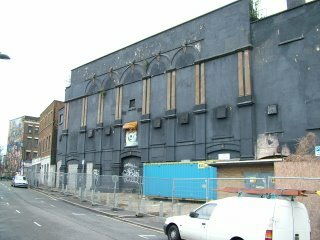 Its popularity as a legendary reggae and soul music club led to its expansion into the whole building when the Labyrinth Club was founded. These buildings stand as landmarks in the lives of many in Dalston’s community as well as the lives of many previous generations. 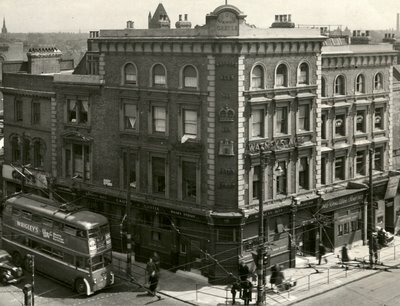 Hackney Council had bought the buildings' site in 1977 for £1.8million from Tesco. In 1995 the Council declared the Gaumont Cinema, as it was then called, suitable for redevelopment. Shortly afterwards, its roof coverings were removed. The Council would have had great difficulty demolishing a nationally listed building to enable its site to be redeveloped. English Heritage recently commented "this building, when intact, may have been a strong candidate (for listing), but they are now too far gone; the shell survives but its splendid decoration is much lost...". After years of talk it finally seemed that the neighbouring Dalston Junction station might reopen. This presented an opportunity for the sale of the site to a developer. The Four Aces and the Labyrinth clubs were doomed. By 1998, despite deputations and thousands petitioning the Council, the occupiers of all the buildings were evicted. The buildings were boarded up, the rain poured in and the destruction of the magnificent interiors began. But the railway didn't come and the sale fell through. The buildings remained on death row whilst the Council did nothing but wait for the next development opportunity. Today the rain has almost completely destroyed the interiors. 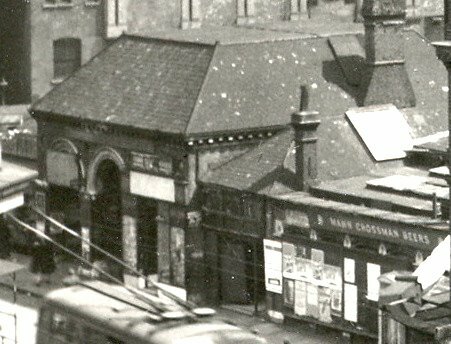 Plans emerge for a new bus and rail "transport interchange"
This photo shows the original 1865 Dalston Junction railway station as it remained until recently. 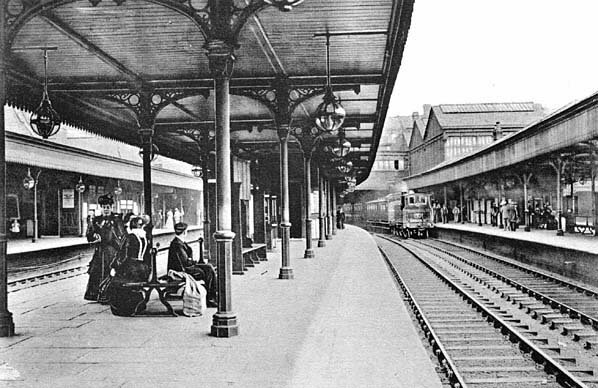 It provided a direct link to Broad Street station in the City. The huge Broadgate development in the City, near Liverpool Street, made fortunes for some but it also involved the demolition of Broad Street station. The cost of integrating new platforms was considered unviable and the line was sacrificed. By 1986 we had lost our rail connection direct to the City and Dalston station was closed. 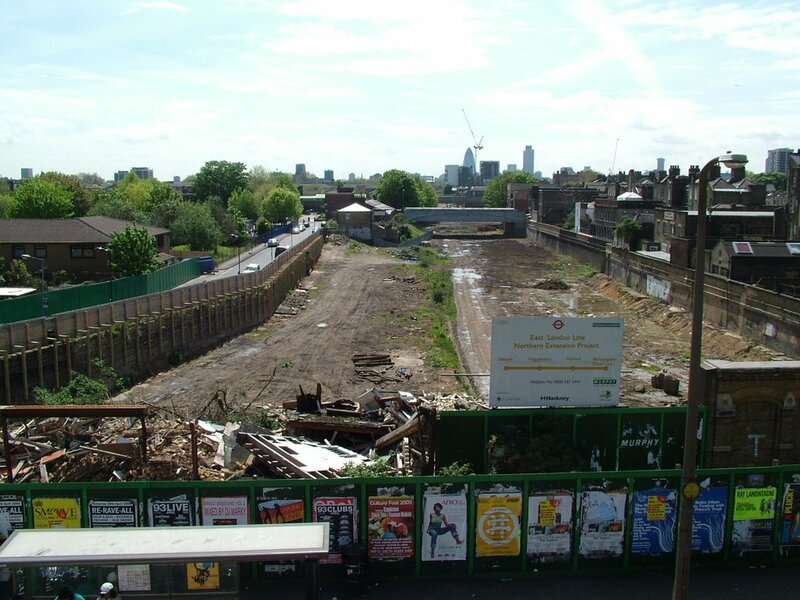 In 2004, with new plans to extend the East London Line up through Hackney to Dalston, and plans for a new bus station, Transport for London (TfL) quietly concealed the original station entrance behind hoardings and demolished it. 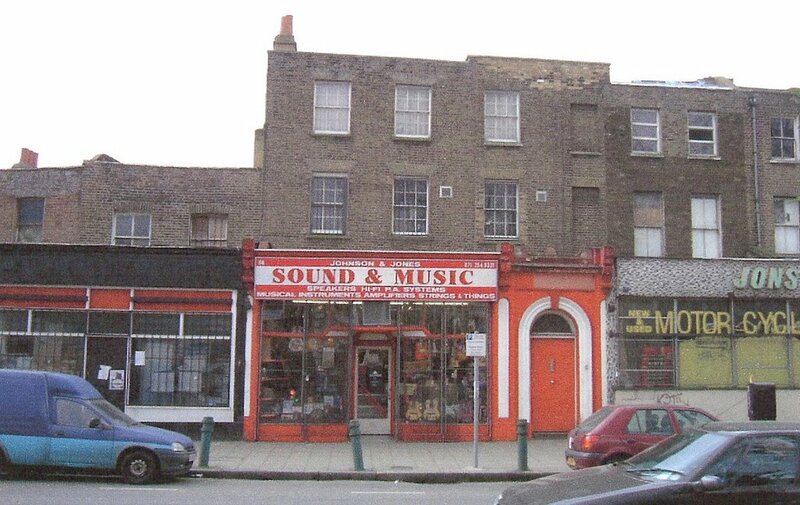 TfL also bought the Oxfam building in Kingsland Road with the intention of demolishing that too. By 2005 it had created a vacant 2 acre development site. They had big plans for it - and for the Council's neighbouring site. TfL and the London Development Agency (LDA) are agencies of Ken Livingstone's Greater London Authority (GLA). In early 2005 the Council began working with the GLA, TfL, the LDA and others on TfL's scheme for a bus and rail transport interchange and a masterplan for both sites. The problem was the huge cost of building a bus station on top of a railway station. TfL required £28millon to build a concrete slab over the railway cutting. A strategy was agreed to achieve these objectives. The solution was to be the demolition of the historic buildings, with the LDA & TfL to then obtain planning permission to build towerblock flats for sale on the two sites and the Council to then sell its land to a developer, with the planning permission, and use the profit to subsidise TfL's development. 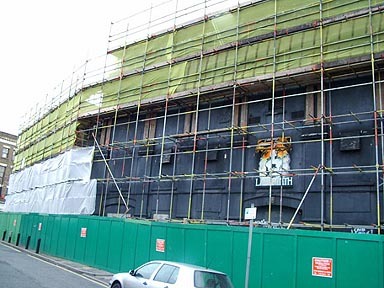 By April 2005 the Council had prepared a demolition contract and put the hoardings up around the Georgian houses and the old Theatre. Demolition was to start within three weeks. OPEN alerted the community to what was happening. As details of the authorities plans started to emerge, public unease and concern grew. In May OPEN threatened a Court application unless the public were consulted. The Council denied that there had been any decision made to demolish and stated that planning permission and approval by the Council's Cabinet would be necessary. 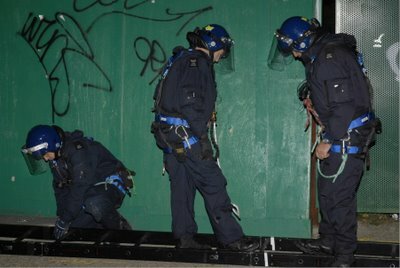 But by September the Council's senior officers had met Hackney's Mayor and it was agreed that demolition of the buildings would go ahead without public consultation. Their fate was to be decided by a few Council officials. The Council publicly denied that there had been any "formal decision" - but demolition notices had been posted on the site. OPEN was granted an injunction by the High Court to prevent the demolitions. An internal Council inquiry found that the buildings' dilapidation was due to the Council's own acts or neglect. It also found that "repairs appear practicable". The Council finally acknowledged and accepted its legal obligation to consult the public about the demolitions. OPEN agreed to lift the injunction. In February 2006 the Council made an application to its Planning Committee for permission to demolish the historic buildings. Council officers, in their "enthusiasm", wrongly advised the Committee that their independent report had condemned all of the buildings as beyond re-use whereas the report, in fact, had not. The Committee members had no idea of what would replace the buildings, or when. Despite overwhelming objections by the public the application was granted by the Planning Committee amid angry scenes at the Town Hall. OPEN had obtained independent reports of its own. Despite the years of neglect, and the derelict appearance, the buildings had survived. Combining at least some of the historic buildings in a new development seemed possible and, as the Council's own environmental consultants had recommended, alternative schemes should at least be considered. OPEN was granted another High Court injunction to stay the demolitions. "There is absolutely no doubt, based on my experience, that (the Theatre) building can be satisfactorily brought back to a situation where it can be reused. My experience suggests that repair will not be excessively expensive." 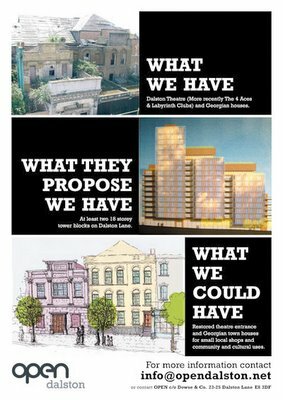 A second independent report, by planning consultants Prometheus, found that the refurbishment of the Dalston Lane houses would produce "a surplus of between £1.5-£1.8million" and the old Theatre "could be an exciting project...and needs cross-subsidy from profits on development of other parts of the site". But those profits were not to be spent improving the Council's own scheme because they had already been promised to TfL, whose cost estimates had by now risen from £28 to £39million. At over £3million per bus stand it was "not surprising that TfL want to use other peoples money i.e. Hackney's." 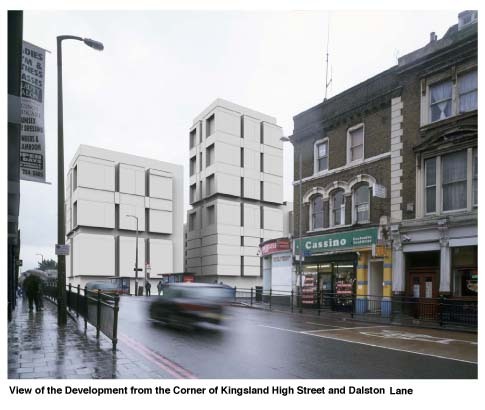 New Dalston - the vision they call "regeneration"
The authorities grand vision for demolition of historic Dalston and its planned redevelopment resulted in hundreds of objections when the two schemes came before the Planning Committees. The scale of redevelopment seemed to overwhelm the area. Neither did it seem to meet local needs. Of all the 550 new flats, only 28 would be for social rented housing. The rest would be for private sale. By the time both planning applications had been made to the Council we could finally see the total impact of what was proposed. Despite hundreds of objections, the Planning Committees voted them through. 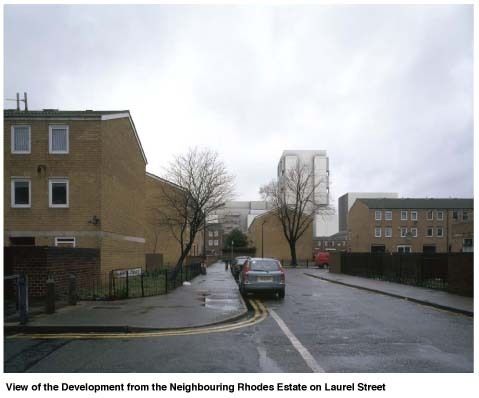 Unless these schemes were approved, it was said, Dalston would remain derelict forever. The possibility of retaining some of Dalston's existing character and history had never been considered. The government has said it will not intervene to change TfL's plans - because the bus/rail transport interchange is "an essential part of the transport improvements required for the London Olympics 2012". Save our past. Save our future. The developers will not be building the new Jerusalem in Dalston but towerblock flats for sale which will overshadow and blight the area. They will be seen as a buy-to-let opportunity to house a transient population. Sub-standard designs may well lead to them becoming the slums of the future. We will see our children living at height with nothing for them except a dark playground at the bottom of the canyon between the skyscrapers. 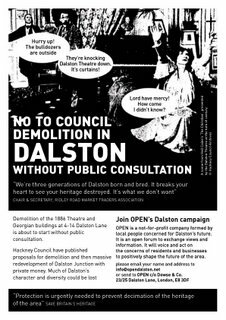 It is a hypocritical betrayal of Dalston’s community, and of hard won Council policies, to condemn future generations to this and, without a second thought, to wipe out our children's and grandchildren’s heritage into the bargain. We do not want to live in the past, but we do want to live with it. "[These buildings] represent the heart and soul of Dalston. We believe they represent both the past and the future of Dalston’s prosperity. 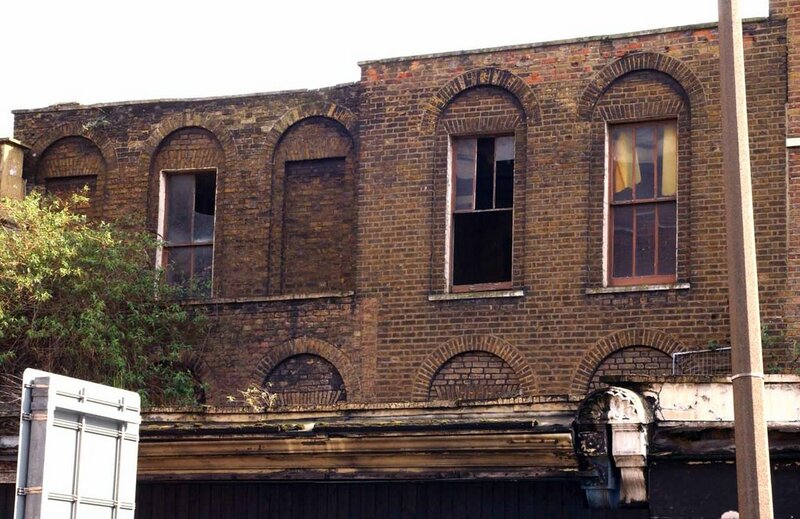 We want to see them restored so that we can show our grandchildren how Dalston used to be and so they can share our pride in our heritage and identity." 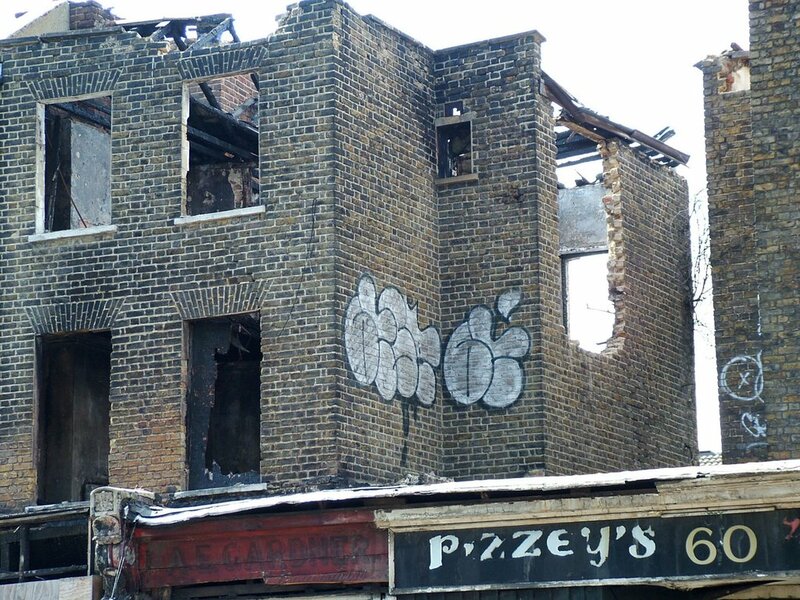 "This [demolition] will destroy the memory and history of black culture in Dalston." "This group of buildings' potential is obvious and there is no need whatsoever to tear them down." 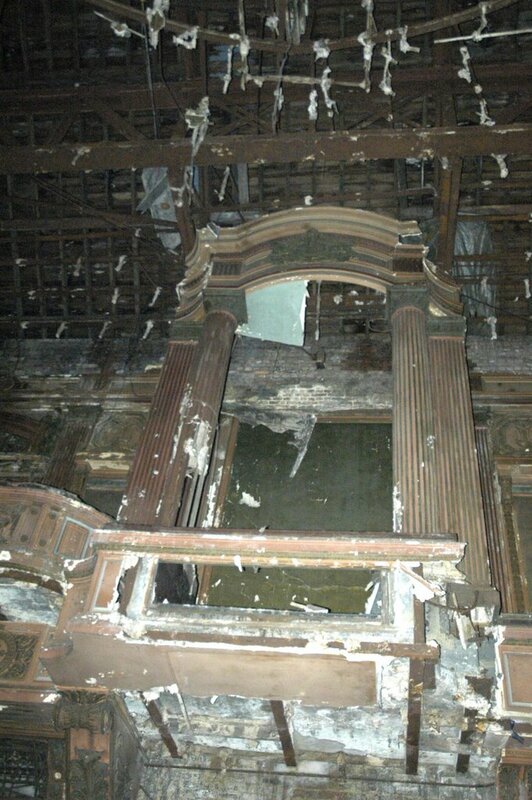 " Their demolition would be an unforgivable oversight...our built heritage is irreplaceable." It is recognised that TfLs rail/bus interchange is likely to bring vehicle and pedestrian gridlock to the Junction. Now there is talk of further demolition - the Crown & Castle pub on the Junction is under direct threat of demolition. And, with the announcement to link Dalston Junction to the Overground, the authorities have already started work on Dalston Lane North. TfL already own the buildings above the route from Dalston Junction to the North London Overground and the Council's neighbouring properties are all long vacant and looking increasingly derelict. The planned destruction of historic Dalston is almost complete. The writing is on the wall. On 4th September, the Council granted planning permission to the London Development Agency to demolish Dalston Theatre and Georgian houses and redevelop the site with towerblocks. The Council claims that whether any of the historic buildings can be repaired and reused is irrelevant. It claims that only with permission to build towerblocks would the proposed sale of the site to Barratts raise enough money to fund TfL's £38million neigbouring bus station development and that these developments are a once in a lifetime opportunity to “regenerate” Dalston which must not be missed. If reuse of any of the historic buildings is to be considered then OPEN must start new Court proceedings to challenge the permission granted to the LDA. The Dalston Theatre was occupied last February when the Council granted itself planning permission to demolish the buildings. In response to recent developments the Theatre's occupiers have issued a fresh call to resist the demolitions. Neither the Council's Mayor nor its local Councillors nor the LDA have attended any of OPENs public meetings despite invitations to do so. Last May OPEN again invited the Council to meet to discuss its concerns but this proposal was ignored. The Council are reported in the press to now want dialogue and not further court action. In 2002 Hackney Council faced a £70million debt and its Chief Executive ordered the sale of all surplus assets. It flooded the market with the community's "family silver". This included the auction of 16 Georgian houses at 60-76 Dalston Lane which, despite the Council's policy to offer them first to the existing business tenants, were sold for £1.8million as one lot to an off-shore company. 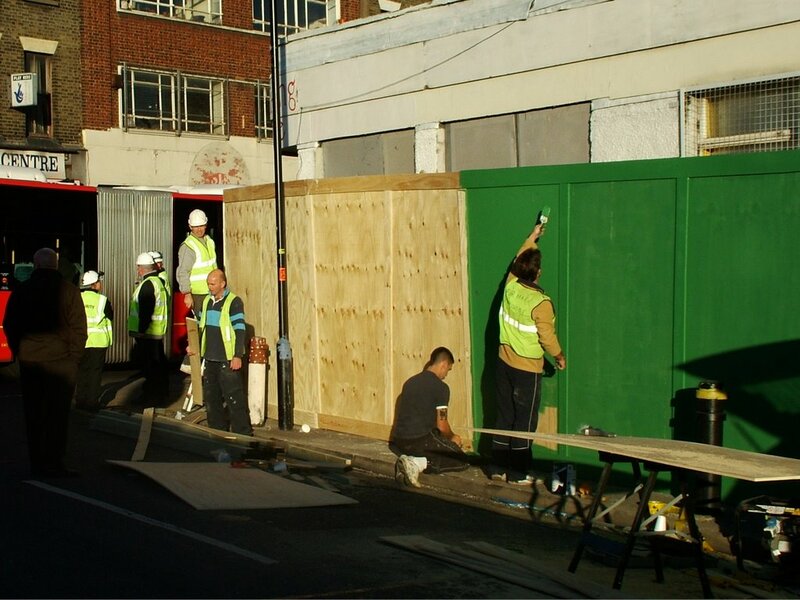 A similar sell off had happened in Broadway Market, to a related off-shore company, where the tenants also lost out. The new owners wanted to demolish and redevelop the site, but English Heritage, and later a government inspector, found the houses to be "remarkable suvivors of Georgian architecture". Permission to demolish the houses was refused. The Council had been running down, emptying and boarding up the houses for years. Since their sale the destruction has continued. Between the time of the auction and the planning decision, three of the houses burnt down. Of the 16 businesses originally transferred to the Council by the GLC in 1982, only four now remained in occupation. The houses, the local economy and the environment were being destroyed. In January 2005 Hackney Council declared the terrace part of a conservation area . "The future is looking very good for businesses and residents" claimed Guy Nicholson, Hackney Council's Cabinet member for regeneration, "We're keen conservation areas are used to bring buildings back into use and create improvements to the built environment"
But since then another of the houses has burnt down and two more of the businesses have been evicted. There have been 8 major fires in Dalston in the last 2 years, all affecting buildings subject to redevelopment plans, including the Council's former housing office in Roseberry Place. Following a Council inquiry into its mass property sell offs, the Council agreed in March 2006 to begin work immediately to asses the use of enforcement and compulsory purchase powers to regenerate the houses. Nothing has happended since then despite the fine words - except further deliberate damage which has destabilised two more of the houses. A cloud of suspicion hangs over Dalston Lane. On 30 March Hackney Council granted Transport for London planning permission to build a £39million concrete slab above the new Dalston Junction railway station and a bus station, a 20 storey tower and other blocks of flats and shops on top of the slab. All the flats will be for private sale. The photo shows the scale of the development. The government has said it will not intervene - because the bus/rail interchange development is "an essential part of the transport improvements required for the London Olympics 2012". The Council also wants to sell a 125 year lease of its own neighbouring land to a developer. On 13 July it granted the London Development Agency planning permission to demolish Dalston's historic buildings and build 19 and 10 storey towers and other blocks on its land. 75% of the flats will be for private sale.Of all 533 new flats on both sites, only 28 will be for rented social housing. The authorities say the demolitions are needed to maximise the profit from the Council's site to pay for the concrete slab on TfL's site for which there is presently a £19million funding shortfall. TfLs bus/rail interchange is to benefit London-wide commuters but why the Council have agreed with the authorities that Hackney's tax payers are to fund TfL's development, and that Dalston must be blighted, remains a mystery. The agreement is "confidential". 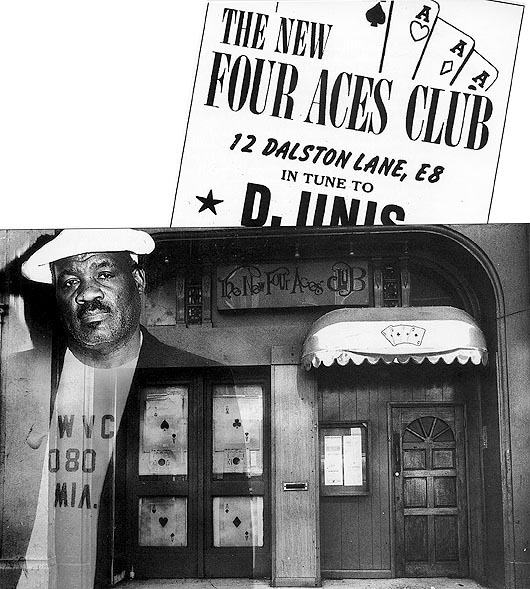 The demolitions include the 1886 former circus entrance, the oldest in the country, at 12 Dalston Lane - more recently the legendary Four Aces reggae and soul music club. The Council made these decisions despite a year of public consultation when hundreds of objections were made to them. The consultants' reports now reveal that the authorities had already agreed last year that profit from developing the Council's neigbouring land would be used to fund TfL's private development - and not to finance affordable homes, open green space and refurbishing our heritage buildings to benefit our present and future community. The developers will not be building the new Jerusalem in Dalston but towerblock flats for sale which will overshadow and blight the area. They may be seen as a buy-to-let opportunity to house a transient population and become the slums of the future. We will see our children living at height with nothing for them except a tiny dark playground at the bottom of the canyon between the skyscrapers. It is a hypocritical betrayal of Dalston’s community, and of hard won Council policies, to condemn future generations to this and wipe out our childrens’ and grandchildren’s heritage into the bargain. We do not want to live in the past, but we do want to live with it. Underneath Dalston Lane, at the north end of both TfL’s and Hackney’s site, is the planned route for the Chelsea/Hackney tube line (Crossrail2)– a benefit to Hackney of far greater significance than TfLs proposed shuttle service from Dalston to Whitechapel tube station. Although OPEN alerted Crossrail2 to the London Development Agency’s revised plans, to increase the height of the northern block from 7 to 10 storeys, Crossrail2’s enquires with Hackney Council in April were initially met with a denial that the LDA’s planning application lodged in March even existed. Crossrail2 is a statutory consultee and, after further enquiries, it eventually received an invitation from Hackney to comment and duly replied requiring certain planning conditions to ensure that the foundation works for the proposed towers do not interfere with the land safeguarded for the new tube tunnel. Imagine Crossrail2’s surprise to learn that the Council’s Officers had reported to its Planning Sub-Committee last Thursday 13 July that there was “No Response” from Crossrail2. Members duly approved the LDAs application, without Crossrail2’s conditions, by use of the Vice-Chair’s casting vote. Crossrail2 is now even crosser. On 18.7.06 the Government Office for London replied to OPEN to explain the Secretary of State’s decision not to call in TfL’s planning permission to build a bus station, shops and towerblock flats for sale above their proposed new Dalston Junction station. The nub appears to be that the proposed transport interchange is “an essential part of the transport improvements required for the London Olympics 2012” and that the local objections made (that the development blights the area and provides no adequate community benefit) do not raise sufficient conflict with national policies to merit intervention. OPEN has also learnt that TfL require the value of Hackney Council’s neighbouring site to contribute to the £19million funding shortfall on the cost of TfLs over-station slab and the demolition of Dalston’s historic buildings on that site to maximize its value. Last year the authorities denied that this had anything to do with the Olympics and everything to do with “regeneration”. 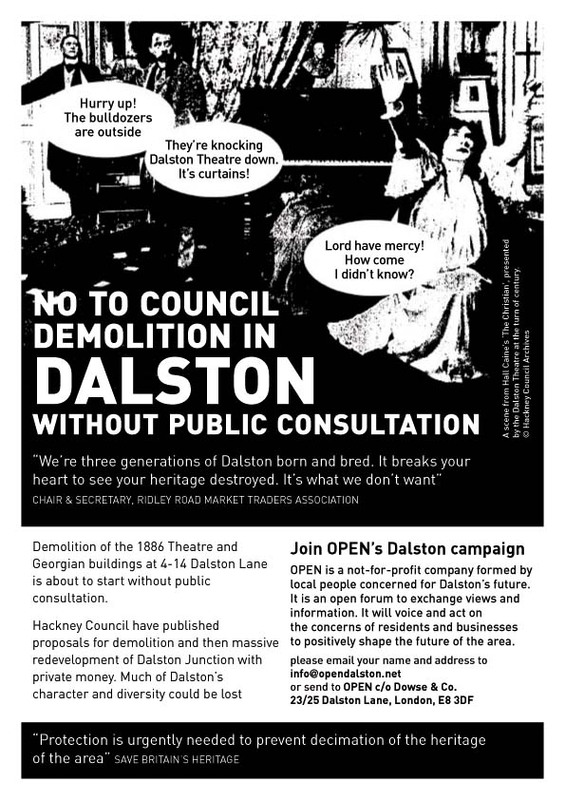 On 13 July Hackney Council’s Planning Committee, in the presence of numerous local people and groups of objectors, was divided on whether to grant planning permission to the London Development Agency to demolish Dalston’s historic buildings and build a 19-storey tower and other blocks on the site. The Committee were faced with a decision to demolish all or none of the historic buildings but no option to retain any of them although the need to consider alternative options had been pointed out to the Council by their own independent environmental consultants, White Young Green, who reported on 1 June that “a more detailed analysis of the alternative development schemes considered for this site would be helpful in justifying the choice based on a range of environmental and socio-economic reasons”. Independent planning and heritage consultants, Prometheus, had undertaken an assessment at OPEN's suggestion and written to the Council demonstrating their financial viability. The Council officers did not refer the Committee to this assessment. The Chair of the Committee withdrew prior to the debate, having previously expressed objections to transport aspects of the scheme and the LDA’s “tired old arguments”. The Vice-Chair, Darren Parker, chaired the Committee. He is an employee of the Commission for Architecture and the Built Environment (CABE) which stated that it was "very supportive of the scheme” (although it is not known what alternatives CABE considered). Councillor Parker voted in favour, and then used his second casting vote to obtain a majority in favour. CABE’s support was subject to two caveats. To ensure the success of the scheme arrangements for the management and maintenance of the housing and open space must be secured and the architects needed to be retained through to completion to ensure the quality of detailing and the finishes. The Committee reserved its position on the open space only. 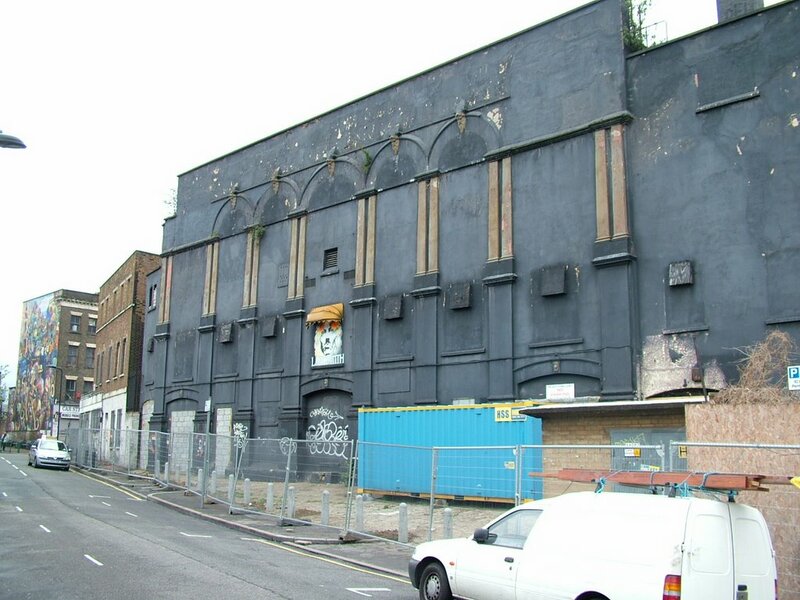 The London Development Agency’s application for the demolition of the Dalston Theatre/Four Aces Club, and redevelopment of the Council’s DLS site has been recommended for approval by Hackney Council officers. 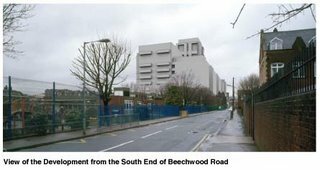 The site is south of Dalston Lane between Beechwood Road and Roseberry Place and adjoins TfLs Dalston Junction railway site.The Planning Committee will consider the application on 13th July. The Council plan to sell the entire site to a private developer on a 125 year lease. • a high-density development of tall and very tall buildings of between 10 and 19 storeys. Buildings exceeding a maximum of 12-15 storeys directly contravene the Council’s own brief for the site which it agreed in July 2005. The towers will not create "attractive landmarks" or "enhance local character", contrary to London Plan policies, but will appear as an imposition derived from the Council’s desire to maximise density without regard to local conditions and streetscape. •there are only 11-14 metres distance between the buildings leading to noise pollution and loss of privacy for the high-rise residents – the Council’s policy is for 21 metres distance between such buildings. 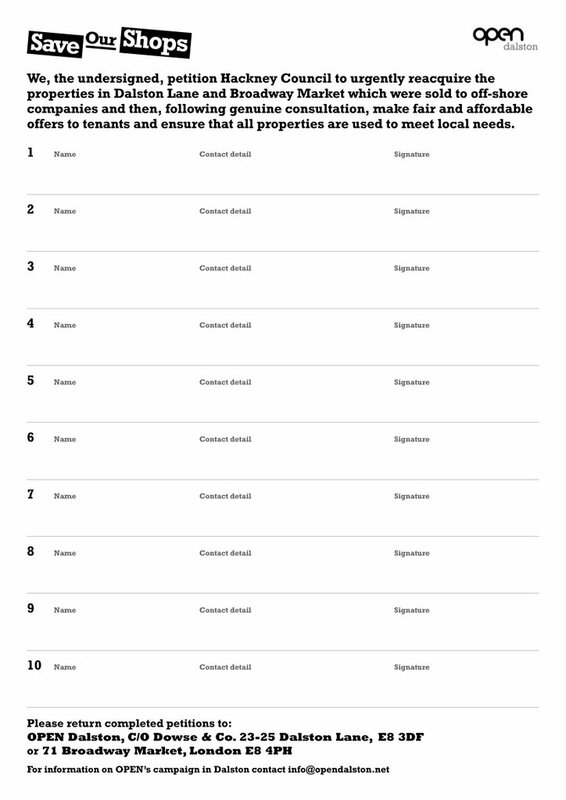 • 244 flats but only 24 of them will be 4-bed and over – failing to meet the greatest need locally for large family accommodation and the Council’s own policy requiring sufficient larger properties in new developments. 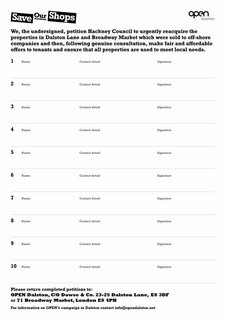 • of all the 553 new flats planned across the Council’s and TfL’s neighbouring development only 5% are for social rented housing and only 10.5% will be “affordable housing”. All the rest will be for sale. • closure of Roseberry place to create a mainly granite-surfaced open space of 4900 sqm but only 2600sqm of which will in fact be usable by the public as such, the remainder being thoroughfares and service roads. Orientated north/south in a canyon between the towers most of the open space will on average be in shadow or darkness for 22 hours per day. Only 110sqm (2% of total open space) is reserved for children’s play. • the towerblocks will cause overlooking and overshadowing of neighbouring homes on Beechwood Road many of which will fall below minimum daylight/sunlight levels. • the provision for car parking fails to meet Hackney Council’s policy standard of 0.5<1 spaces per dwelling and this, together with 616 cars, 17 vans and 3 HGVs which are predicted to visit the site daily once construction is completed, will increase parking pressure locally. The new car parking spaces are likely to be offered for sale for £15,000 each. 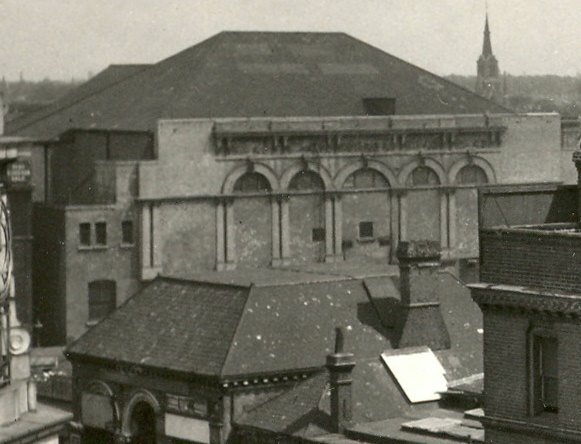 The 1886 circus building was converted into a Victorian variety theatre in 1898, the largest cinema in the country in 1920, and a variety of uses since then inluding the Club Four Aces and Labrynth clubs since 1966. 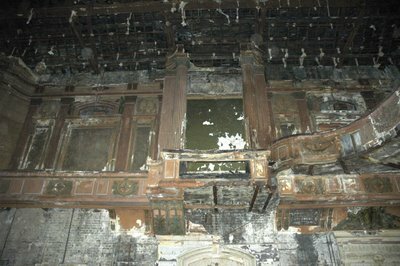 In 1999 the Council evicted all occupiers and allowed a process of "deliberate neglect" which has led to the destruction of the magnificent interiors. Demolition is also proposed for the two earliest surviving Georgian houses on Dalston Lane which are locally listed and which the Council’s UDP policy is to retain and enhance and which are obviously capable of reuse. On 6th February Council officers reported to Planning Sub-Committee that a structural engineer's report had been obtained by the Council which had concluded that major structural elements of the buildings had been damaged beyond repair. In fact the Council had not obtained such a report but the Committee voted to demolish the buildings. The Council has never intended the retention of any of these buildings although appearing to consult on the possibility.It agreed last summer to maximise the profit from the site and contribute any surplus to fund the construction of TfL's £39 million above-station concrete slab for which there is a £19 million shortfall. On 30 March the Council granted TfL planning permission to build a bus station, shops and 309 private flats for sale in high-rise blocks of up to 20 storeys, on the slab. Their consultant, Drivers Jonas, reports that "throughout the project it has been the intention ...that any land value arising from the DLS proposals would contribute to the construction of the slab". TfL has stated to OPEN that retention of the buildings "would adversely affect the viability of the air rights developments approved on Dalston Junction Interchange". Quite how the Council achieves "best value" by giving away Council taxpayers' funds to finance TfL's private development, which has no affordable housing or local community benefit to speak of and which overshadows Hackney's own site, remains a mystery. The buildings are presently protected by a High Court injunction, granted to OPEN on 6th April, which is the subject of a forthcoming Court hearing. The brief also included the provision of entertainment, community and arts facilities, to its stated objectives for the sites. Few of these objectives will be realised by the proposed development and, in fact, the opportunity for many of them will be irreversibly destroyed. The Council, the LDA and TfL have never held any public consultation or presentation where the current proposals for these neighbouring sites could be seen and discussed together despite the stated intention for them to be jointly developed in a “complementary” way. Consulting on each site separately from the other created a misleading impression of the combined cumulative effect of these controversial developments. This statement reaffirms OPEN’s view that the public consultation has not been “transparent, accessible and accountable” and nor has it “actively promoted (public) participation and involvement” but the strategy has been solely to tick off the landowners “legal consultation boxes” and there has been no intention on the Council’s & TfL’s part to vary the Masterplan which they and the GLA agencies decided upon in the summer of 2005. 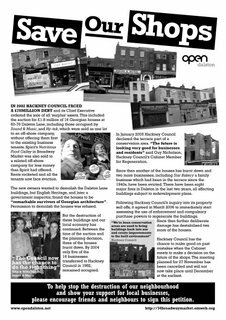 OPEN members do not want to live in the past, but we do want to live with it.The developers will not be building the new Jerusalem in Dalston but towerblock flats for sale which will overshadow and blight the area. We will see our children living at height with nothing for them except a tiny dark playground at the bottom of the canyon between the skyscrapers. 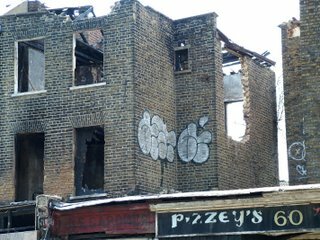 It would be a hypocritical betrayal of Dalston’s community, and of hard won Council policies, to condemn future generations to this and wipe out our childrens’ and grandchildren’s heritage into the bargain.